"Come Take a Trip in My Air Ship"
Come, have a spin around Mars. I thought that perhaps it was time for a musical number. Unfortunately, there is one title that, and this is probably attributable to its rarity, seems to completely elude not only open access sites, such as the above, but also the publishers of pulp reprints. From April 1929 to July 1929, Ramer Reviews published the now almost mythical Zeppelin Stories. 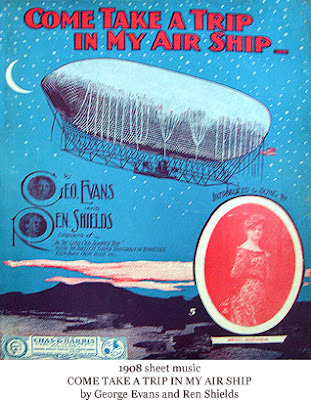 Like Train Stories and Submarine Stories, Zeppelin Stories was the product of a trend toward narrowing the focus of pulp titles to the point of utter absurdity. Because of its scarcity, I have never actually read an issue, but evidently most of the stories involved air warfare, spies, and of course Zeppelins (and, given the above cover, the occasional gorilla). With only 4 published issues, this title has become the holy grail of pulp collecting. The odd thing about this title is that, though it’s impossible to find reprints or downloads of any of the stories it contained, a couple of recent titles have harkened back to it. For many years, pulp fans used to joke that the ultimate in silly cross-genre pulps would be something like Spicy Zeppelin Stories. In 1989, Chicago’s Tattered Pages Press supplied a punch-line to this joke by actually publishing a collection of stories under that title (fortunately, no one has ever attempted a Spicy Submarine Stories). Even more recently, in 2004, Wheatland Press published the story anthology, All Star Zeppelin Stories (ISBN 0972054774). It’s still on my list, but I have yet to get around to purchasing it. One book I have purchased and love dearly is The Zeppelin Reader: Stories, Poems, and Songs from the Age of Airships, edited by Robert Hedin and published by U of Iowa P in 1994 (ISBN 0877456291). Nevertheless, there is still a void that desperately needs to be filled. Surely there is a collector out there who could take out a digital camera and make some PDF’s of the original Zeppelin Stories available online. Perhaps Girasol, Adventure House, or Wildside Press could be compelled to attempt some reprints. Hell, if I had access to the stories, I would type them up in ASCII by hand. The time has surely come.